It’s so much fun to relax while watching the red carpet coverage and then the award show. I typically pour a big glass of wine and pop some popcorn to enjoy the during the show. 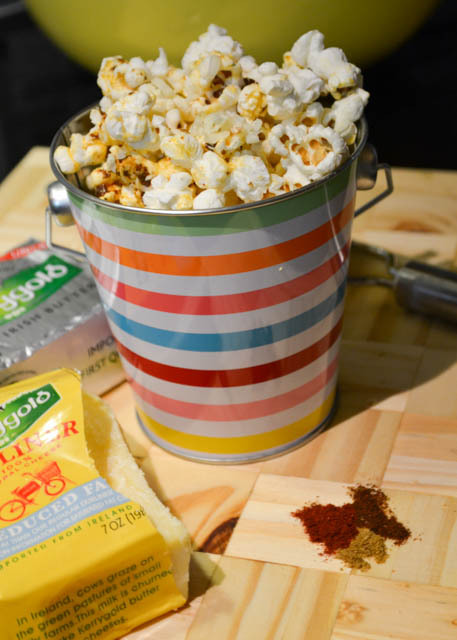 And this year I am going to be making this Guilt-Free Cheesy Fiesta Popcorn. I hate when something is called “guilt-free”. But really this is a guilt free recipe as you can enjoy a big bowl and not feel bad about splurging on such a rich treat. You know, so you can be red carpet ready for when Leo calls you up to be his last minute date. Or maybe Bradley will give you a ring?!?! One can hope! 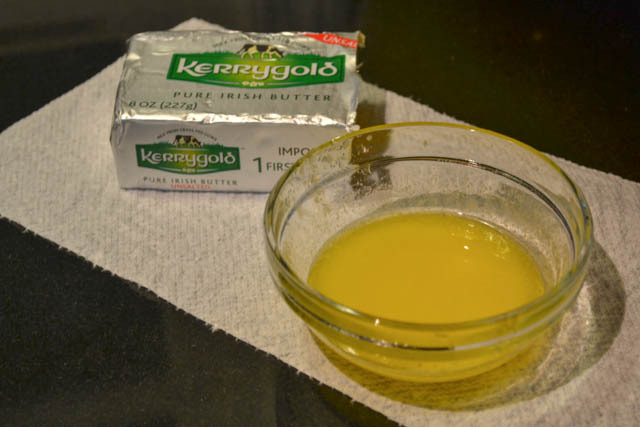 I created this recipe for an entry in Kerrygold‘s Light Recipe contest. Price and I were trying to think of things that would be great and light using their cheeses and butter. We toyed around with ideas like quiches, mac and cheese, veggie burgers, and even wacky ice creams. 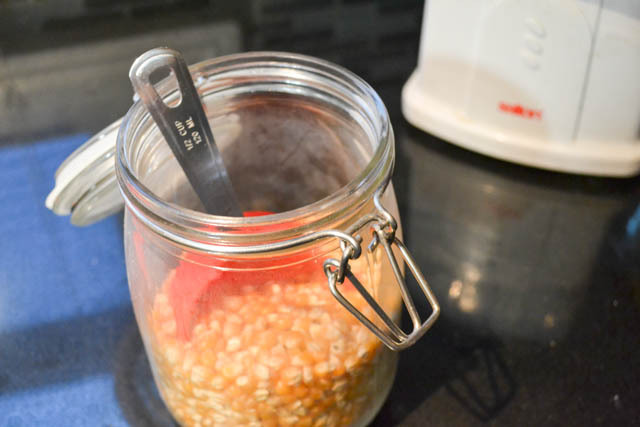 But ultimately we kept thinking of snacks, like dips and taquitos, and decided to make a fun, healthy popcorn recipe. But what flavors would I add to some air-popped popcorn to amp it up? Would I make a herby popcorn? Would it have some curry to make it Indian? No, I knew just what it needed… it needed some spice! I would make a spicy popcorn that used spices that I use in taco seasoning. Umm, yum! And then the next step was deciding the Kerrygold products to use! Well, I feel you can’t have popcorn without butter so I obviously would be using some of Kerrygold’s butter. Their cows are grass-fed, resulting in a bright yellow butter that is packed with so much rich flavor. Since their butter is so flavorful you don’t need much to leave an impact on your dish. I used unsalted butter so I could control the amount of salt in the dish. 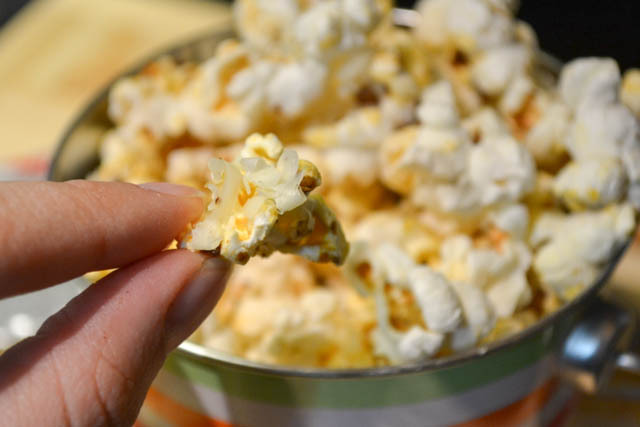 You always add salt to popcorn so by starting with unsalted butter you control your sodium intake. Okay, so what cheese would I use? I wanted to pick a cheese that was really flavorful, again so that it would stand up against the smokey, spicy flavors from the spices while adding a lot of flavor itself. Kerrygold’s #1 seller is their Dubliner cheese so I was thinking of using that but then decided on their reduced fat version. Tons of nutty to sharp to sweet flavors with less fat! A total win at just 80 calories and 6 grams of fat per serving! 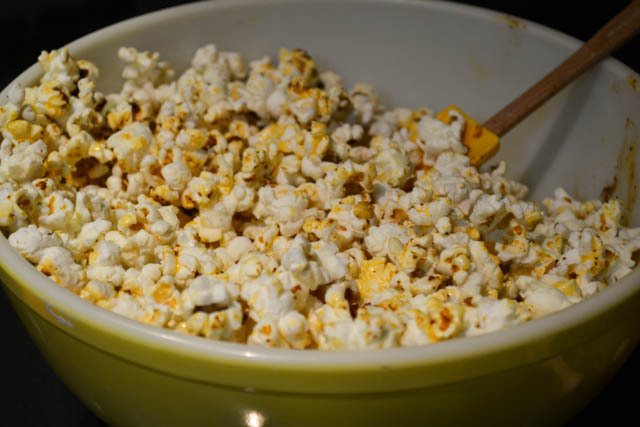 This Guilt-Free Cheesy Fiesta Popcorn recipe makes 3 very generous 6 cup portions servings of popcorn. The batch of popcorn could serve more comfortably but, for calculations purposes, let’s stick with the 3 servings since that is what my buddy Orville Redenbacher says 6 cups is 1 serving. Each serving is 197 calories, 9.5 grams of fat, 4 grams of saturated fat. This definitely beats movie theater popcorn! Grab a bowl and enjoy! 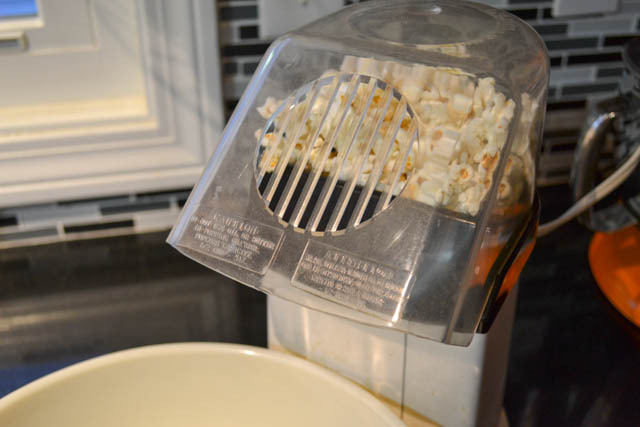 Using an air popper, pop the popcorn into a very, very large bowl (you need room to mix it all up). 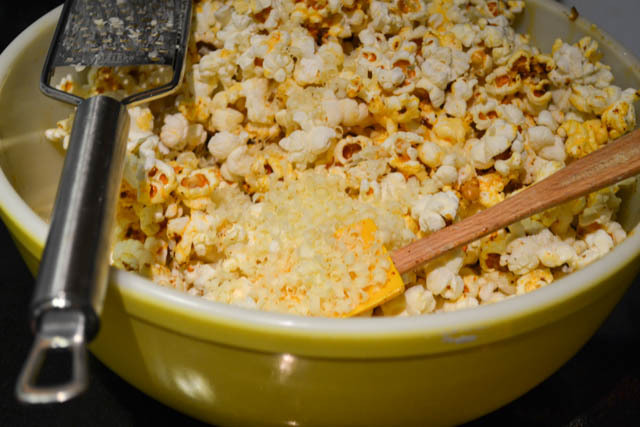 While the popcorn is popping, finely zest the cheese and then set aside. Again, while the popcorn is popping, microwave the butter on low heat to melt it. Then add in all of the seasonings to the melted butter and mix thoroughly. 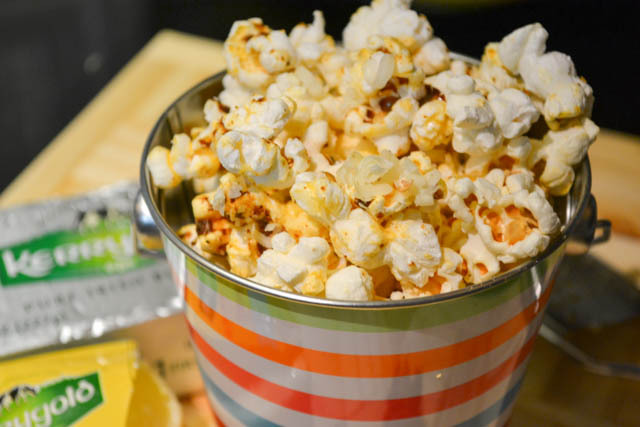 Once the popcorn has popped, immediately, pour the seasoned melted butter over the popcorn, mixing as you go to evenly coat the bowl of popcorn. Immediately, sprinkle the cheese on the seasoned warm popcorn, mix as you go to coat the pieces. Then portion out and enjoy! 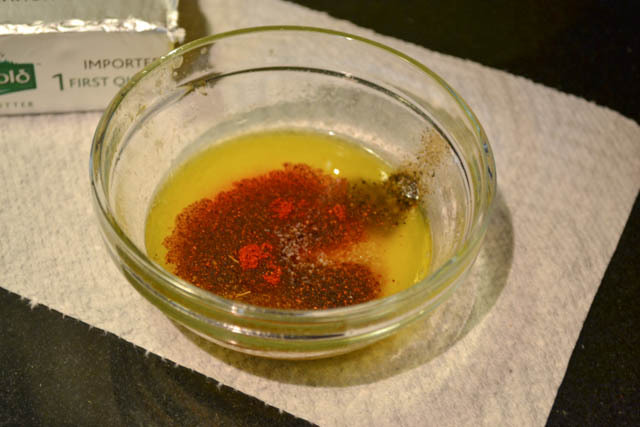 Mixing the spices into the melted butter: super smart! That’s my first “why didn’t I think of that” moment! !